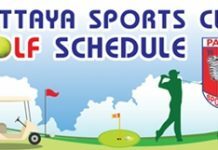 We were due to play at Bangpra today, however the reports were that this course was very dry due to the weather so we made a late change to Pattavia. Monthly Mug winner Maurice Roberts (left) with John Anderson. It had been some time since I last played here, since the days of the ‘Old Clubhouse’, and I was really looking forward to improvements in that area. I remember two toilets, four showers and a dreadful restaurant full of flies and many players ceased to go. On arrival this time at the new clubhouse I actually found it difficult to locate the changing room, despite it being opposite the reception and signed as ‘Changing Room’ – and that is when I am sober. However, when I finally got in I was impressed with the modern facilities and decent sized lockers. We were able to change in comfort and get out to the first tee after paying a great rate to play this course. On the day the weather was overcast and not too hot, so the walkers were in a good mood and we moved around well. There has never been any doubt about the quality of the layout, only the bad road leading to the course and the quality of the facilities in the past. We found the course to be fine, even if the greens were faster than any I have played this year and three and four putts were on nearly every scorecard. All in all it was a fine day out. Round over it was back early to Pattaya and we were soon into the results. 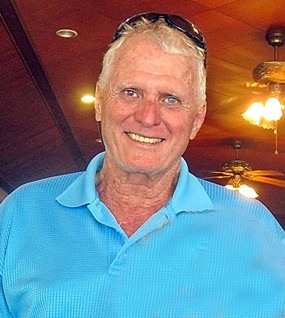 The winner with a fine 37 points was Don Carmody, ahead of Maurice Roberts in second with 35, Kenny Chung third with 34 and John Davis fourth on 32. Then it was time to relax and discuss the day out and decide we would definitely go back to Pattavia again soon. Near Pins: Daryl Evans, Don Carmody, Landis Brooks. Well, it was that time of the month again! No not that, but time for the Tropical Golfers to brave a day of traditional golf and play stroke. Who would have thought simply counting all your strokes and subtracting the handicap would create such butterflies? 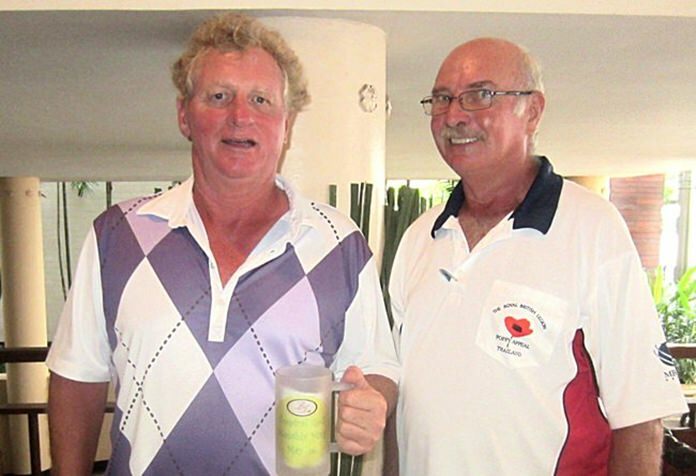 There is a reason for it however, the Tropical Golfers Monthly Mug is not to be given to just anyone – ya gotta earn it! In an attempt to find greener pastures the destination this time was Royal Lakeside. Eighteen hopefuls signed up for slightly longer ride hoping to win the Mug. We all know most local course conditions are below standard, though it’s not their fault. Medal play requires some thought on what course to play, so we decided Royal Lakeside was a good bet. The course condition was fair-good, which for RL is below their normal carpet fairways. They are feeling the effects of a dry hot summer too. Still, the course was quite playable and the greens in good nick. If you hit it straight Royal allows for some serious scoring opportunity, and even with many scores below net par, one player sure took advantage. The Mug is some motivator! Without any suspense, we’re happy to announce Maurice Roberts (H/cap 15) won the Monthly Mug with an astounding net 63! Maurice can brag to having many titles; PSC President, PSC Golf Chairman, and now most important of all a Tropical Golfers Mug winner. Great shooting Maurice! Farther back were excellent scores but mere mortals. John Anderson (31) was runner-up with a net 67, and then came (in count-back order) Andre Van Dyk (16), Mick Coghlan (22) and Barry Elphick (28) all at net 68. For the rest there is always next month! Near Pins: Barry Elphick (2) Anders Pedersen, Maurice Roberts.